Over the last couple of years the ages of my beginners has gone from 6 or 7 years old to 3 to 5 years old, mostly 4 and 5. I am very excited about this but I find myself in a dilemma. I believe that children must learn to do things correctly before going on to the next thing, and this really works for most kids. One of my parents is very frustrated with this concept. Most children learn from doing things repeatedly and from copying what we do without constant correction. We use learning language as an example of how this works. We don’t say “no, it’s not ‘peas’, it’s ‘please’. We are happy they are attempting the word and know that as they continue to hear it in their daily lives the correct pronunciation with eventually come out. How does this work with bow hands and playing position? How do we ensure the thumb is bent and the little finger round without helping to correct? Without correction, how will the child know what they are physically doing is incorrect? The same as playing position—how does a child learn how to hold the violin without someone first placing it for them and then when they learn themselves, making corrections? Are my expectations too high if I expect a young child to learn these things correctly? I currently expect the bow hand to be correct before we even do shoulder bowing. Am I being too picky? I just think that if we move on too soon the student forgets about the “old” thing and only thinks about the “new” thing. I have a three-year-old who started last spring and was much easier to deal with then, than she is now. She wants to be completely independent and do everything her way, when she wants to, without correction. Her mom, who was very dilgent in choosing a teacher and the Suzuki method, has read the books, taken ECC, and done everything I have asked, is feeling very disillusioned right now. She knows that her daughter can be a challenge but thinks I could be less picky in order to give her more independence so she would enjoy things more because she could do it herself. The daughter makes her bow hand very soft for placement of the bow, but has no care about a bent thumb. She also refuses to cooperate when her mom tries to place the violin in playing position and when I do it she always has to “fix” it. (She is still using a box and stick). We are both becoming frustrated and the daughter no longer comes to the lessons willingly. A couple of weeks ago she refused to even come into the room when she saw me. I have talked to the mom about this and she really wants violin to be an enjoyable activity for her daughter and we have brainstormed about how to handle things but she is committed only until Christmas because, while she doesn’t want to give up, she doesn’t want to force her daughter to continue something at age three and then end up hating it. Right now I am feeling very unsuccessful as a teacher. In order for a student to advance, what is being asked has to be both possible and perceivable. If you are insisting on details that the student is physically incapable of, or cannot discern, then sitting in that one place and not allowing progress in areas that are possible would seem, from the student’s perspective, unreasonable. There are a number of ways to interpret this “one point until mastery” bit. Let’s admit that true mastery isn’t going to happen for a lo-o-ong time anyway, and use the review process to keep returning focus to that one point until the skill is established and stable. So, for instance, shoulder bowing, which focuses on moving the bow arm, and developing rhythmic awareness and ability, does not require a thumb bump. You could hold the bow in your fist, and the bow arm would still get effective training. It would be fine to work on both simultaneously, re-setting the bow hand frequently, then as both get easier asking her to moniter the thumb, first noticing when the bump flattens, then trying to maintain the bump for a certain number of rhythms. Students will not forget about the “old” things—unless you never speak of it again, but they certainly will not focus on two things at once. A skill that is shaky will unravel a bit in the presence of something new that takes all their attention. Not to worry! Just make sure that some of the practice assignment addresses the older skill, so that that continues to develop. Consider as well that after a point, it actually helps the skills strengthen by having to function without “direct supervision”. The Mom—and the student—are giving you important feedback. Being a good teacher is not only going by the book; it is also teaching in a way that works for the student in question. Maintain your standards, certainly, but maybe relax your time frame and your sequencing. Developing technique is not an once and done thing, anyway. You may be still addressing things with Aunt Rhody that an older beginner “got” while working on Twinkle; by the time they are in high school, who could tell the difference? Are you using the “beginner’s bow hold” (thumb on the outside of the frog)? If the student makes a soft hand on the bow, I am generally very pleased—for a 3-5 year old, that is probably a good enough approximation of a bow hold at this point in time, even if the thumb is not “bumpy”. You can always go back and refine it later, when the child is developmentally ready to have finer control over their finger joints. The child’s toungue is not yet ready to tackle the phonetically hard combination of “P” followed immediately by “L”, so asking it would be equivalent to asking them to run a marathon—their muscles CANNOT yet be ready! —If you really have to have a more perfect bow hold, you can always teach the child left hand while you or the parent bows (by kneeling just behind and slightly to the right of the child). Then they are learning “songs” while refinement of the bow hold is going on. I recently realised that older beginners (say, 5, 6 or 7 years old) are more likely to quickly get into bad habits which take a lot of time and effort (and tedious practice) to ‘undo’. Younger beginners seem to just ‘catch on’ to something when they are ready, even though they might have been doing it wrong for 12 months. This happens with language too. Children might pronounce a word incorrectly (eg ‘Peas’) for a year, but then as soon as they learn the RIGHT way, there’s no turning back. In the past 2 years I have started thirty students aged between 2 and 3.5. (Yes, most have continued!) It’s been a bit of a crash course, but I have overhauled the way I teach the early steps, because I have seen how differently the young ones learn. It’s so fascinating. I would tend to agree with PiperKate and RaineJen. I find that the really little ones get so much more from the overall experience than it seems they are capable of understanding or even demonstrating at any given moment. The important thing is to keep modelling the right thing, and consistently introducing and reinforcing the right concepts. Over time, things tend to click and gel. Older children (say 6-7 years and up) are more intellectually mature and tend to respond better to direct instruction because they are better able to be responsible for their own learning, so to speak. You need to demand more from them because unless directly taught or corrected, they well gravitate towards doing it their own way, thereby forming bad habits if left unchecked. The younger ones still learn more from osmosis… just existing, experiencing, exploring, discovering. They are toddlers, and toddlers learn that way. They are relatively less experienced and willing to respond to so much direct instruction. On the other hand, they crave an overall experience from which to observe and absorb. For example, you only have to observe a group class of 3-4 year-olds. How many of them seem so clueless in class, yet they come home and prattle on about every detail? Not to say that it’s not worth teaching younger children to a high standard… on the contrary, they will probably learn it better, and more naturally, the younger they are exposed to it. They just absorb it and reproduce it in their own way, in their own time, that’s all. The key Suzuki concept here is the power of the environment. We just need to provide the right one, and trust in the process that the children are taking everything in on some level. When responding to little points of instruction, sometimes the youngest kids are only capable of focusing on one concept at a time… we need to be sensitive to this. 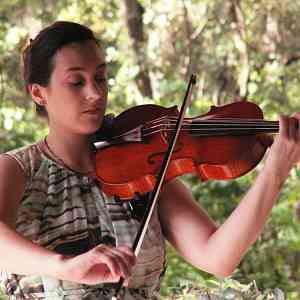 One day it may be bow hold, another day it may be finger placement without regard to intonation. Another day it will be intonation only without regard to timing. Etc.etc.etc. At some point, all of these will come together in various combinations until it’s all there. I am finding this with my own 4-yr old violinist, in addition to my piano students. While we need to keep the bar high and strive for the highest standards, we need to allow the children to get there one little step at a time, celebrating each milestone and gently motivating toward the next. I think the “peas” vs. “please” example is bang on. Thank-you for the great responses and for putting teaching a three-year-old into perspective. I will keep in mind all of the advice and I will relax and let this little girl enjoy the whole experience as she develops at her own pace.